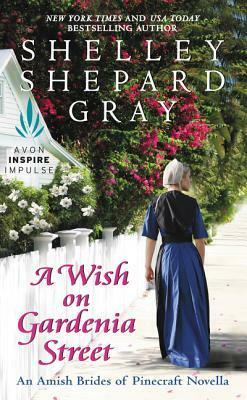 Today I am reviewing A Wish on Gardenia Street, a novella to be read after The Proposal at Siesta Key and before A Wedding at the Orange Blossom Inn, also part of the Amish Brides of Pinecraft series by Shelley Shepard Gray. Good things may come to those who wait, but Mattie Miller is confident that great things come to those who go after what they want…and Mattie wants Danny Brenneman. Danny is the reason she’s returned to the sunny Amish community of Pinecraft, Florida—well, that and to see her best friend Leona get married. Mattie’s met Danny only once before but she knows the spark between them is sure to lead to something special. Despite a missing cat, wedding day chaos, and Danny himself, she’s confident this vacation can only end one way: in an engagement of her very own! I loved reading about Mattie Miller, who we met in The Promise of Palm Grove. In this sequel, Mattie returns to Pinecraft for her friend’s wedding. But Mattie is also hoping to re-connect with Danny Brenneman, the young man she’s been corresponding with since her first visit. Does Mattie find love in Pinecraft? Well, I could tell you… and ruin the story for you, but I’m not about to do that. So I’m not going to tell you. Instead, I encourage you to get a copy of this ebook and read it for yourself. If you’re reading this series, you won’t want to miss this exciting story!